R2 allows you to explore the relations your gene exhibits with other genes in your dataset of choice; correlation statistics is used to calculate this. Using this exploratory analysis, new biologically relevant hypotheses can be generated as will be shown in this tutorial by an example concerning MYCN and MCM genes. 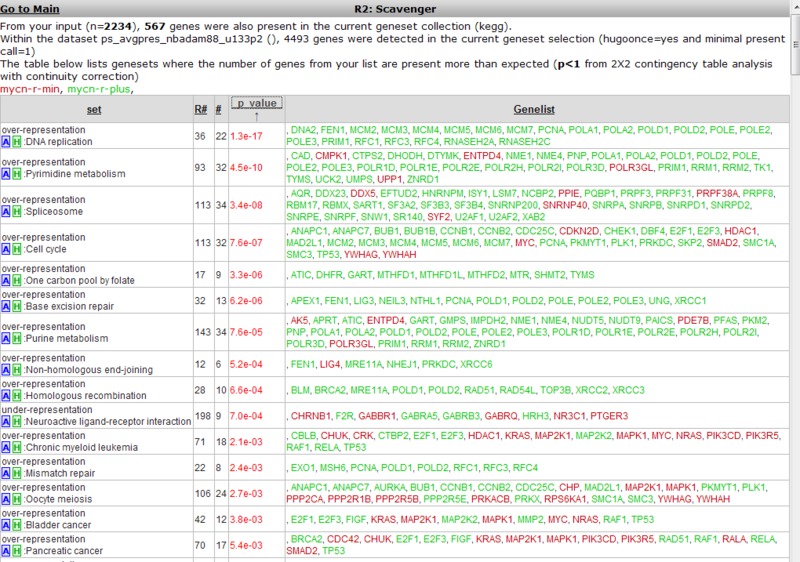 Further advanced analysis based on the use of sets of genes can be found in the Kaplan scanner and GeneSets tutorials. In field 3 select ‘Find Correlated genes with a single gene’ (Figure 1). Further information on the statistics choices and the meaning of the HugoOnce mode you can find in the ‘Differential Expression’ tutorial. Did you know that you can find the correlation between two genes directly? Just choose ‘Correlate 2 genes’ in field 3 if you have a specific gene you want to correlate with your gene of interest. Of course this method would be rather tedious if you want to find new genes, hence we’re exploring exactly this scenario in this tutorial. Another possibility is to correlate your gene with a track (containing numerical data). This essentially tests whether the expression of your gene of interest correlates with the numerical order described in the track. This scenario is further explored in the ‘Differential Expression’ tutorial. R2 calculates the correlation of the expression of MYCN with the expression of every other single gene in the current dataset. A lot of calculations! The result is presented as two tables (Figure 3 ) In the header a summary is given: ~ 2200 combinations of MYCN and another gene met the criteria, i.e. having a significant correlation (p < 0.01) with the expression of MYCN, ~ 15000 genes did not obey these criteria. The left table represents the genes whose expression correlates positively, or is similar, with that of MYCN in this dataset. Of course MYCN has a perfect correlation with itself. Some characteristics of the genes are already described in red. R and p-values are given in separate columns (for a short description of their meaning, consult the ‘Differential Expression’ tutorial). 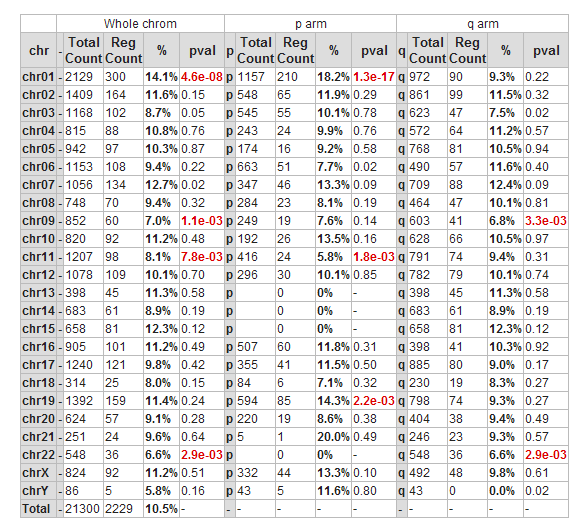 Exact (gene-) numbers listed in the tutorial Figures such as in this example (2208 combinations) can vary. 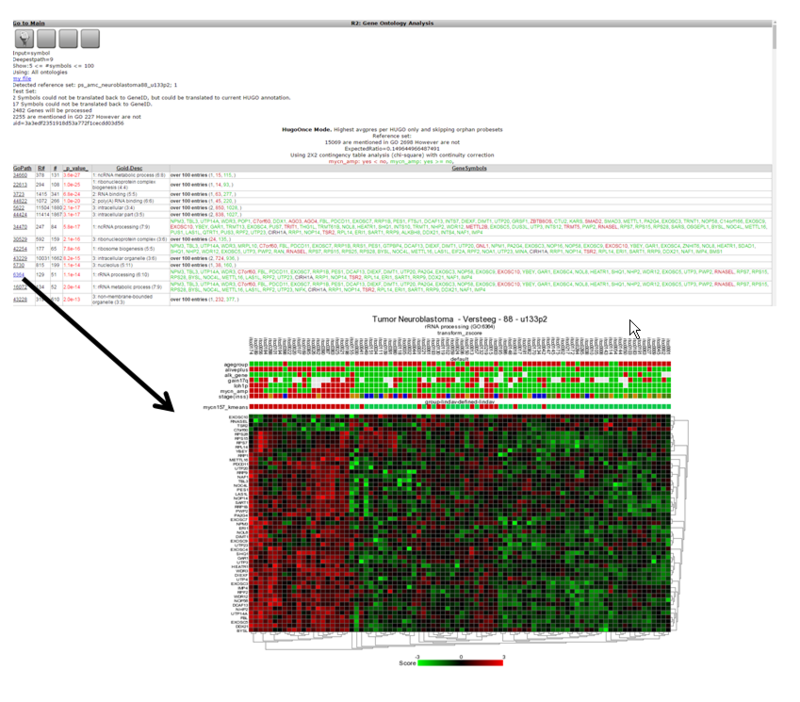 This is caused by database updates upon a new genebuild release or an affymetrix annotation update. The right table summarizes the genes that show a negative correlation; the expression of MYCN behaves oppositely to that of these genes. A little table to the right summarizes the results of a limited Ontology analysis. More about that in subsequent steps where we also explore the menu items to the right. All gene names are clickable to explore the specifics of the correlation in a separate graph; try and click the APEX1 gene in the left column. In the left upper corner the filter icon is located , this links directly to the “adjustable settings panel “ where you adapt the filtering conditions . 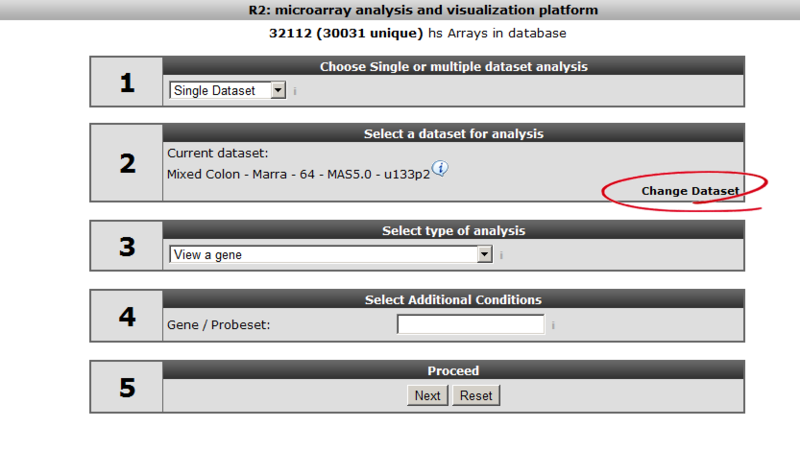 The filter button is accessible in many analysis modules of R2. 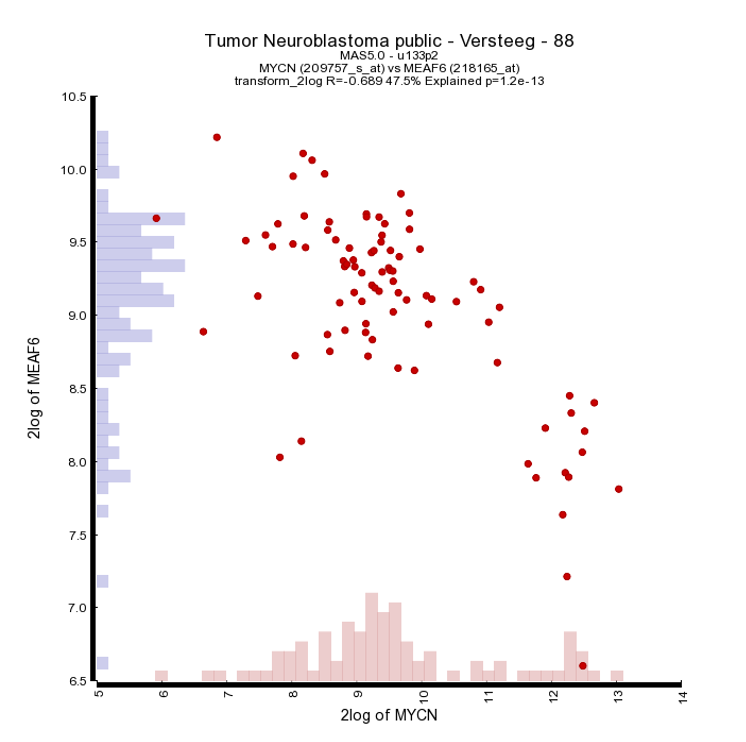 The resulting graph depicts the expression of both genes in this tumor series in a graph. 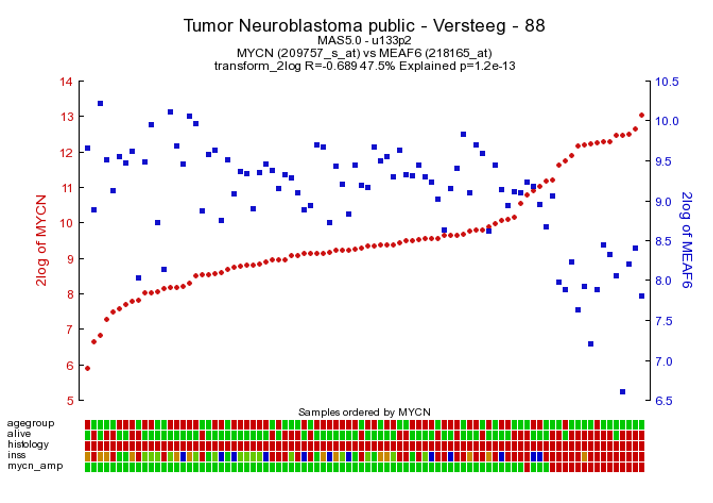 The tumor samples are ordered by increasing MYCN expression. Note that the expression of APEX1 follows the expression of MYCN quite good! This is reflected in the R and p-values that are quite significant. Figure 5: The expression of the MYCN gene correlates with the expression of the APEX1 gene. For an opposite example, click on one of the the top genes in the right column; MEAF6. This produces Figure 6. The original list of results is still open in another tab in your browser, return there. 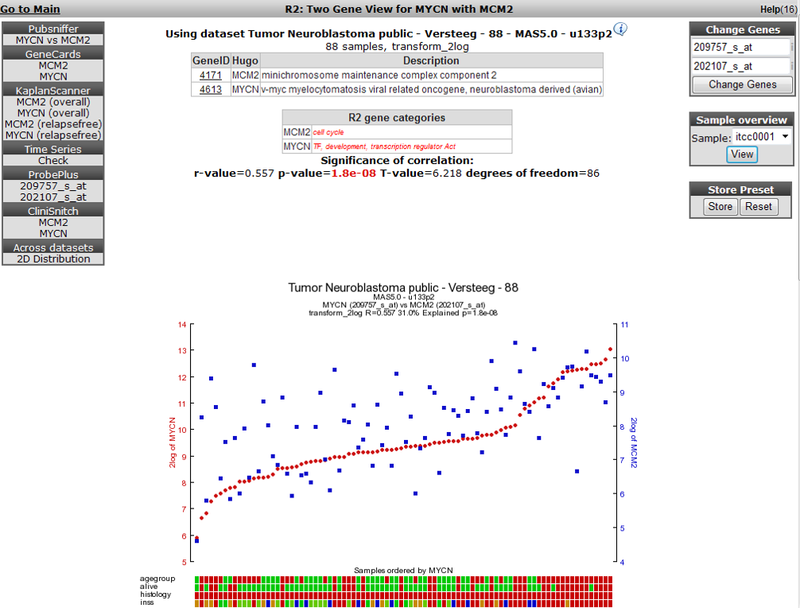 To generate a correlation plot where the negative relation between MYCN and MEAF6 gene is more clearly visualized select “XY-plot” as graph type in the graphics section in the Adjustable Settings box and click the Adjust Settings button. In this correlation plot it”s also still possible to show expression levels for the samples are distributed. In order to do so click on more settings in the Adjustable Settings box and set Histogram to yes, click Adjust Settings button. Now the histogram boxes in the x and y axes show expression levels are distributed for the samples in the selected dataset see Figure 7. Another nice way to adjust the graphical representation of a XY plot is using the gene expression levels and apply these to a color gradient. Select in the “Color Mode” pull down menu the “Color by gene” option. In the next box enter the gene you want to use for coloring the dots. 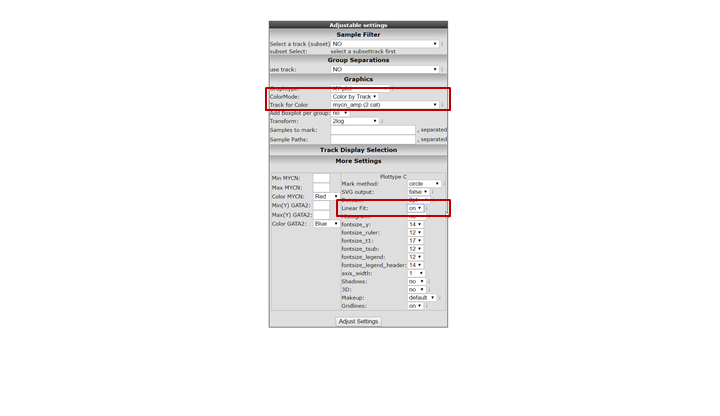 Make sure that after entering the gene name you also select a corresponding probeset and click “Adjust Settings”. 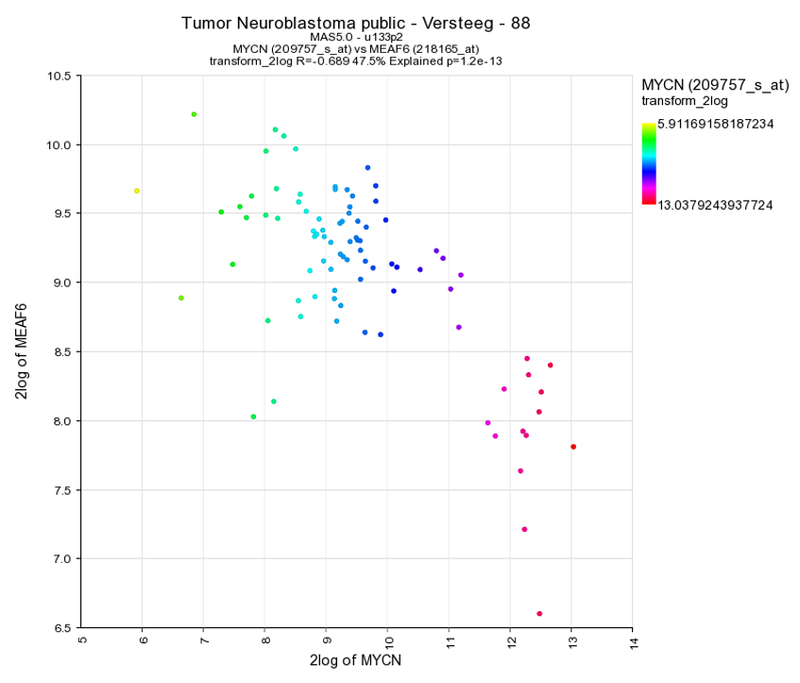 In this example the reporters of the MYCN vs MAEF6 are plotted and subsquently colored by the MYCN expression levels of course you can also enter a third gene for coloring the dots. Another option to visualize the relation for the correlation of expressions in XY plot is to switch on the linear fit option. In the “More settings section”. Turn on “linear fit”. Sometimes it could be that you encounter a correlation plot for two genes where you can distinguish two clusters. One group of the samples seems to form a cluster with a positive correlation and a second cluster seems to have an inverse correlation. An example which is not directly listed in previous list of correlating genes is for example the relation between MYCN and GATA2. In the right upper corner enter MYCN and the GATA2 gene and click ‘Change Genes’. 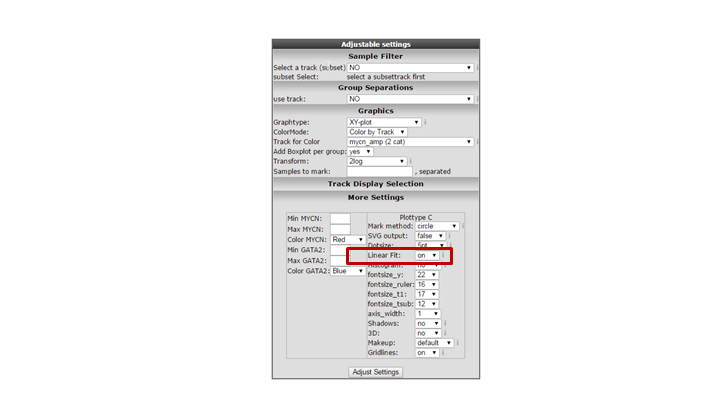 Further change the color mode in color by track , select the MYCN track in the graphics section and turn on the linear fit option at ‘More settings’ as indicated below, click redraw. 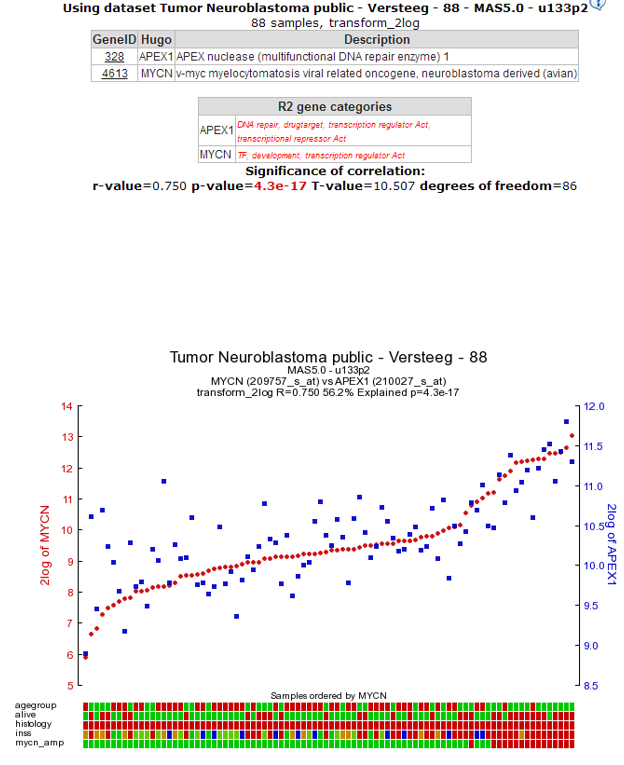 In de next figure the trend line clearly illustrates there is positive correlation for the MYCN non-amplified group and a negative correlation for the MYCN amplified group. 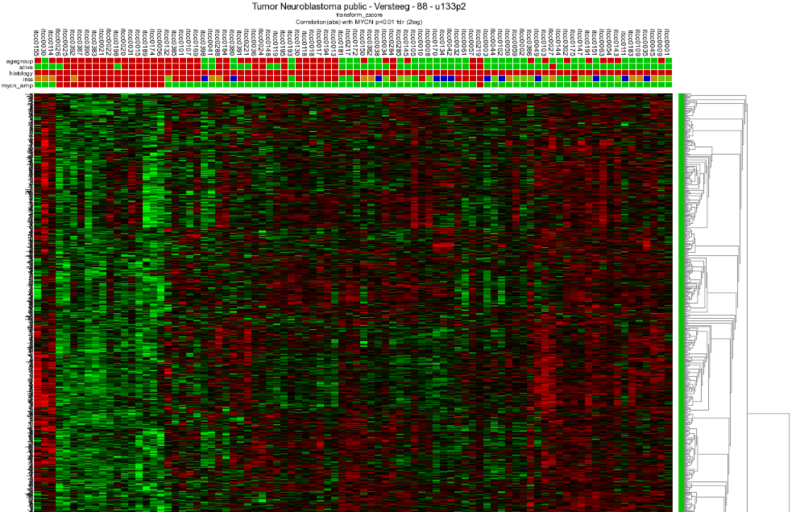 Figure 14 : Heatmap view of the expression of all genes correlating with the expression of MYCN in 88 Neuroblastoma samples. Another view is the mapping of these genes on all chromosomes. Click on the ‘Chromosome Map’ menu item. In Figure 13 this mapping is depicted in an overview. Sometimes, eyeballing already suggests that some regions seem to be affected. R2 provides a table where the statistics behind this analysis are given: Figure 14. The overrepresentation of genes that correlate with MYCN expression with respect to all genes present on (an arm of) a chromosome is calculated. You can also explore the results in the interactive R2 genome browser, where you can zoom into the results and locate individual genes. To enter this mode, just press the ‘View in R2 genomebrowser’ button. Did you know that over-representation is explained here? The resulting categories are presented in a sortable table (Figure 11), sort on p-value by clicking on the column header. Clickin on a pathway ID will open a new screen or tab with the heatmap of the selected pathway. Figure 15: Gene Ontology categories that are overrepresented in the set of genes that correlates with MYCN expression in the current dataset, sorted by increasing p-value of overrepresentation. One of the categories where genes of our current set are overrepresented is ‘DNA-strand elongation’; and what is also obvious that all genes in this process have a consistent positive correlation (as can be seen by the green color). Let’s take a look if we can corroborate this observation in another domain. 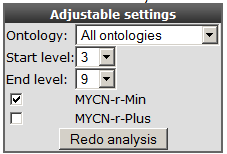 The adjustable panel settings menu allows you to redo the gene-ontology analysis with the up or down regulated genes only. 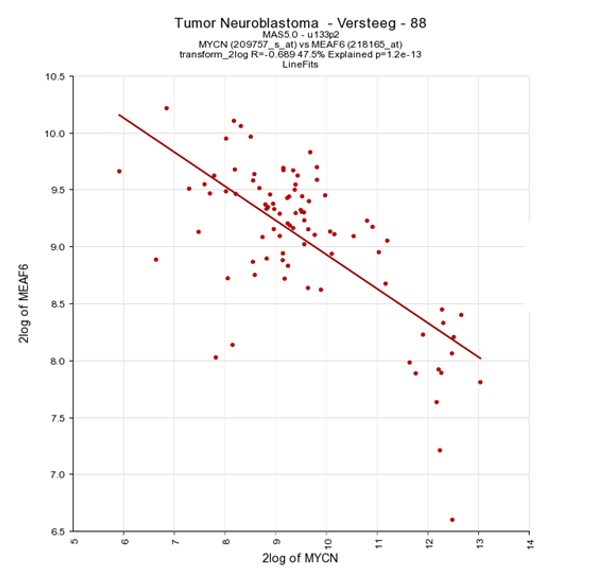 Figure16: Re-do analysis with genes that are either positively or negativelycorrelated withMYCN. In the next screen a choice can be made for other datasets; we use the KEGG database. Click next. 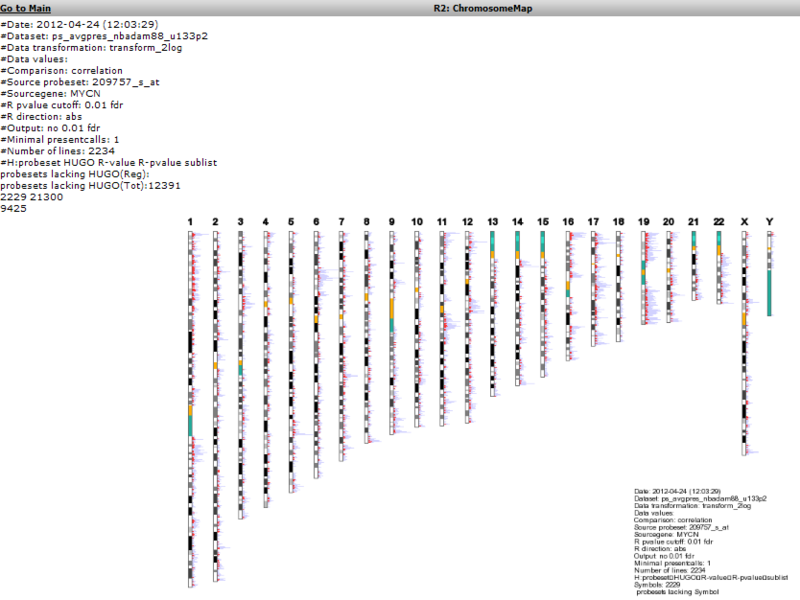 Figure 18: KEGG pathways exhibiting an overrepresentation of genes of the current dataset, ordered by significance. The DNA-replication pathway pops up as most significant. Note that most genes are similar to the GO process found in the former analysis. The pathway will be shown when the blue A in front of the pathway name is clicked. Figure 19: Mapping of the overrepresented genes (darker green) in the MYCN correlating set on the DNA-replication pathway from the KEGG database. Hovering over the gene shows additional information. MCM-genes seem to play a role. Go back to list (Figure 3) to show their individual relation with MYCN. 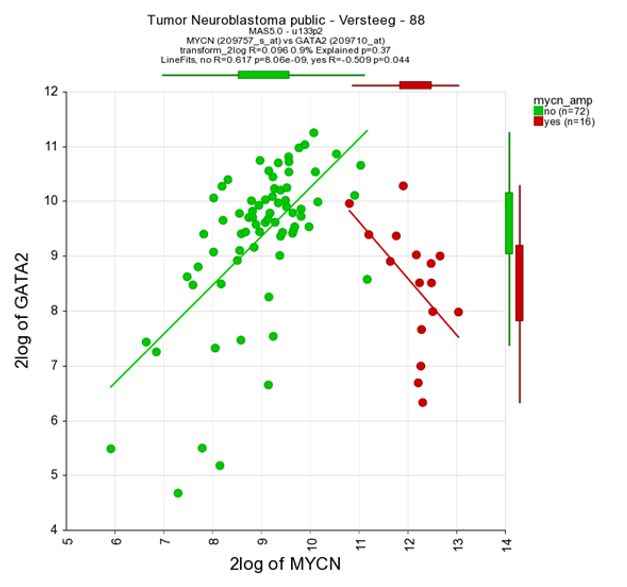 Figure 20: MCM2 expression correlates with MYCN expression. This versatile tool offers quite some functionality to build a literature search query tailored to your needs. That being slightly out of scope of this tutorial, click the “Goto Pubmed with query” button to find the article. This article is actually published work by our group where the relation between the MCM genes and MYCN was proven experimentally. 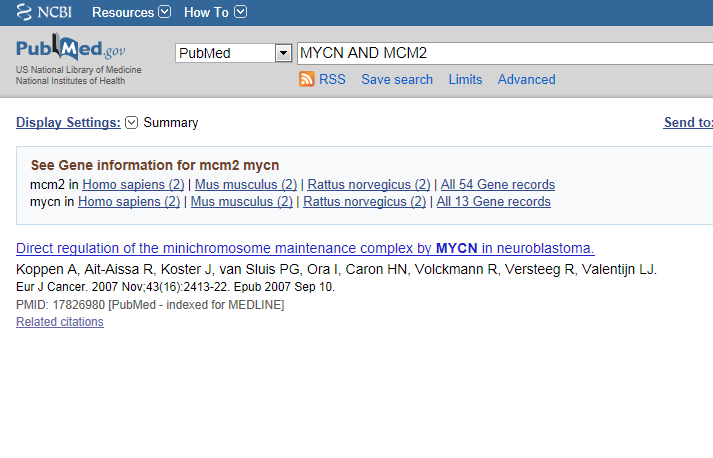 Figure 23: The correlation between MCM genes and MYCN was proven experimentallyin thisarticle. The genelist produced in the beginning of this tutorial (Figure 3) can be stored for use in later analyses in R2, or for use in other applications. Return to the page containing the list, this is still open in another tab in your browser. The menu to the right gives several possibilities (Figure 53). Some of these have been explored already; we’ll touch shortly on the rest of them. “Gene set analysis”: use public genesets; this is further explored in the advanced Correlate with DataSet tutorial. “Map on pathway image”, “Chromosome map”, “Gene Ontology analysis”, “Heatmap” have been explored in this tutorial. “Save current selection as TXT file” produces a tab separated file containing the current analysis. In the header of such file all information is stored to be able to redo the analyses in the future. Last but not least the data can be stored as a personal genecategory; this is further explored in the advanced tutorial “Adapting R2 to your own needs”. Based on this tutorial you can further explore R2 in the set of advanced tutorials.